"...that sound of Aube's, that amazing sound that sang, and roared, and danced, and leaped, and spoke, and was so radiant with power and passion and the life force itself." 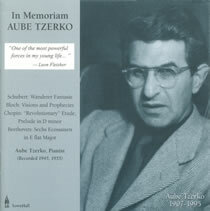 Vintage performances by the great musician who taught many important pianists of our time. 01 Etude in C minor "Revolutionary"